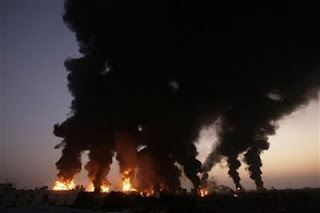 Jaipur: A massive fire broke out at Indian Oil Corporation’s fuel depot in Sitapura industrial area in the outskirts of the city Thursday night killing five persons and injuring 150, police said. State officials said the help of the Army was sought to help douse the fire at the depot which is on the highway near the airport. "The fire is massive. We are finding it difficult to douse it," Petroleum Minister Murli Deora said tonight three hours after the fire spread to adjacent depots. The fire broke out at around 7.30 pm and it may be several hours before it is completely brought under control. Deora said he is leaving for Jaipur tomorrow. Dr Ashok Pangudia, Medical Superintendent at SMS hospital, said two persons were brought dead at the hospital while one person was reported to have died in a private hospital. Some of the injured had splinter injuries, he said. 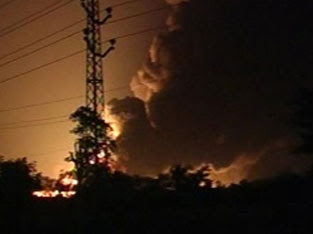 Huge flames shot into the air amid billowing smoke as hundreds of people in the villages in and around the depot panicked and fled from their homes. The fire also spread to some industrial units in a radius of three km destroying them. Rajasthan Chief Minister Ashok Gehlot said the assistance of Army is being sought to help douse the fire. Some Army jawans joined the rescue operations. The injured were rushed to Mahatma Gandhi and SMS hospitals. Some of them had serious burn injuries. 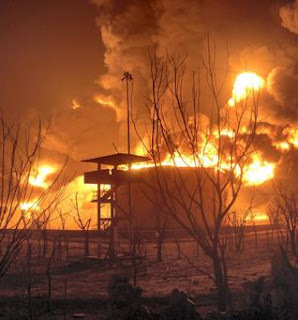 The fire broke out when petrol was being transferred from the fuel depot to a pipeline. A leak in the pipeline is suspected to have caused the blaze. IOC Chairman Sarthak Behuria told a news agency that the fire broke out at a petrol storage tank and quickly spread to other tanks. Police said several explosions were heard. The IOC tank farm had 8 to 10 storage containers that stored petrol, diesel kerosene for supply in Jaipur and adjoining areas. Special teams have been rushed to Jaipur to coordinate the operations there, the officials said. IOC experts are also being flown from Mumbai and New Delhi. Deora has instructed IOC Director Marketing G C Dagga to immediately rush to Jaipur to oversee the rescue operation. Behuria and HPCL Chairman Arun Balakrishanan have been asked to go to Jaipur tomorrow morning. He said the depot was a modern depot and employs a minimal work force 20 to 25 people and it was very unlikely that many of them would have been present at the depot at the time of the fire. He said the fuel in the tank would be allowed to burn out before bringing the fire under control. Officials said steps were being taken to ensure that the fire did not spread far through the pipeline. Electricity in the area has been cut off as a precautionary measure. Rajasthan Health Minister Immamuddin Ahmed said two bodies recovered from the fire site had been taken to Swai Man Singh (SMS) Hospital here and another one to Fortis. At least 50 of the injured have been admitted to SMS, he added.